PBR Bucks Back into AT&T Stadium as the PBR Global Cup: What's New? After Arlington and AT&T Stadium welcomed the PBR for the largest single-day event in league history last season, this year, the “Toughest Sport on Dirt” will buck into the Lone Star State with the first-ever edition of the Global Cup to be held on U.S. soil. The WinStar World Casino and Resort PBR Global Cup USA, presented by Monster Energy will take place at the home of the NFL’s Dallas Cowboys on Feb. 9-10. The event will be the third stop for the world’s only nation vs. nation bull riding competition after debuting in Edmonton, Alberta in November 2017 and then visiting Sydney, Australia in June 2018. The inaugural Global Cup in Edmonton was won by a dominant Team USA, while Team Brazil narrowly defeated hosts Team Australia by 0.75 points to win the latest edition of the event in Sydney. Each team is comprised of seven riders, in addition to one alternate, and a rider-nominated coach. The coach, yet another unique element of the event, is responsible for leading his team and assigning all riders their bulls each night. At each Global Cup, the host nation is afforded a home-field advantage. For the U.S. event, as opposed to having an augmented roster of 14 riders, seen at the past two events, Team USA will split into two squads, Eagles and Wolves, with the Wolves set to be historically comprised of exclusively Native American Riders. Each night, all competing riders will attempt one bull each. Following that round, each coach will select two riders to attempt one more bull each in the bonus round. The winning team will be the nation with the highest total aggregate score from their Top 12 rides. At the past two editions of the PBR Global Cup, one rider, Cooper Davis, has been nominated by the team to be their captain, subsequently leading many to call him Captain America. In Edmonton, he went 2-for-3, covering both of his draws on the final night, to help propel Team USA to a win at the inaugural event. Another dominant force for the Red, White and Blue in Sydney, Davis went 3-for-4 helping the nation to finish fourth. The PBR will make modern sports history at the Global Cup with the all-Native American Team USA-Wolves. Two of the athletes selected to the Eagles bring past Global Cup experience, including reigning Rookie of the Year Keyshawn Whitehorse. The Navajo bull rider, who capped his first-year on the elite tour with the high-marked ride of his career, 89.5 points on Wicked Dreams during Round 5 of the PBR World Finals, began the 2019 season strong this past weekend in New York City, going 2-for-4 inside Madison Square Garden. For the third consecutive edition of the PBR Global Cup, Team Australia will be anchored by the brother duo of Lachlan and Cliff Richardson. In Edmonton, the duo added four scores to Australia’s total, contributing three 8-second efforts on home soil in Sydney. Sidelined by a torn MCL/PCL in his left knee since triumphantly winning the 2018 PBR World Championship, the PBR Global Cup will mark Kaique Pacheco’s return to competition. 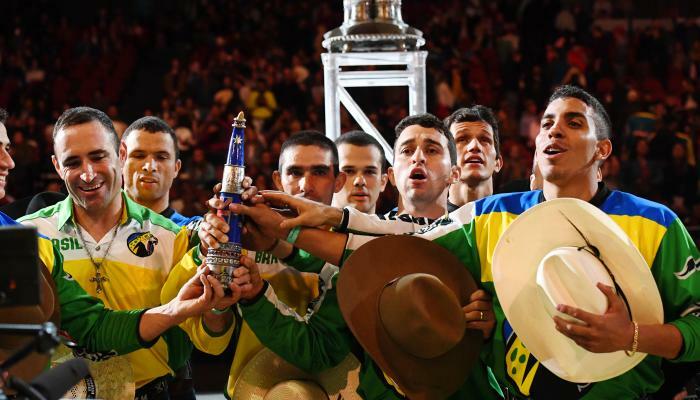 Pacheco was instrumental in Team Brazil narrowly edging Team Australia in Sydney, going a perfect 4-for-4 to also win the individual aggregate honor. When action gets underway inside AT&T Stadium three-time PBR Canada Champion Aaron Roy will make history as the first rider to both compete for and coach a nation at the Global Cup. As the coach for the nation at the past two editions of the event, where Team Canada finished third in both Edmonton and Sydney, the U.S. edition of the event will mark his first time competing. Prior to the 2018 season, Roy had been sidelined as he recovered from a broken femur. Last season, he made a triumphant return, competing exclusively in Canada where he earned three event wins en route to finishing No. 6 in the nation. For the second consecutive edition of the event, Gerardo Venegas will return to lead Team Mexico. Also returning for the second time in as many events is Jorge Valdiviezo, the nation’s top rider for the most recent event in Sydney. Down Under, Valdiviezo added both an 85.5 and 84.75-point ride to the nation’s total. The event will also feature entertainment all weekend long including a Global Cup Fan Zone at Arlington’s Texas Live! sports entertainment complex, which houses the new PBR Texas Cowboy Country Bar, the spectacular 18,000 square foot flagship branded bar operated by Cordish & Co. The Global Cup will begin on Saturday, February 9 at 6:45 p.m. CT, concluding on Sunday, February 10 at 12:45 p.m. CT. Tickets are on sale now and start at just $10 AND you can get a 50% discount on seats with code ARLINGTON. They can be purchased at SeatGeek.com, PBR.com, or by calling PBR Direct at (800)732-1727.